Choose all of the radio features from a vivid, easy-to-read color class leading 3.5" LCD screen allowing you to quickly access what want, when you want it. Station list is searchable by station name / call sign, location, genre or add you own station and store up to 110 stations for easy access. You can save 10 one-button presets and 100 stations in your 'my stations folder'. The Mondo really makes listening to Internet radio as easy and enjoyable as possible. Located on the top of the Mondo is a large snooze/sleep bar to easily snooze any of your five unique alarms or set the 24 hour sleep timer. Each alarm can wake to any of your presets or buzzer. Each alarm can be set for - one time, the same day every week, weekends only, week days (5-day alarm) or daily (7-day alarm). With the included full-function remote control you'll be able to control all the features of the Mondo Wi-Fi music player. Save or select one of your 10 preset stations, search for new stations, skip songs, even provide thumbs up/down, skip or pause Pandora from any location in your room. The built-in media player wirelessly streams your saved music from your PC, MAC, or NAS with support for MP3, WMA, AAC, WAV, AIFF, even 24/96 Flac files. You can also expand your listening experience with the L/R RCA outputs to optionally connect to your home stereo. The built in Aux-in jack connects to an iPhone, mp3 player, or CD player and a USB jack to play music from a thumb drive or connect to Ethernet via a USB to Ethernet dongle (sold separately). Located under the 'Settings' menu option are the equalization controls. You can boost your highs and raise your lows to really fine tune the Mondo's audio performance. 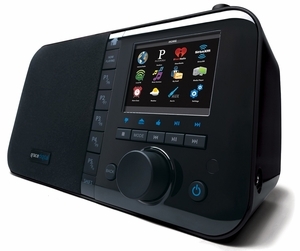 Control one or more of your Grace Internet radios from your iPhone, iPod, iPad or Android phone / tablet. Unit Dimensions: 3.5" x 9.75" x 5.75"